So as I mentioned in my last post, I recently celebrated my birthday with a weekend trip in New Orleans and a shopping spree at some of my favorite places! I thought since I took lots of pictures at the hotel and especially of all the food my friends and I ate, I'd share some of them with you! 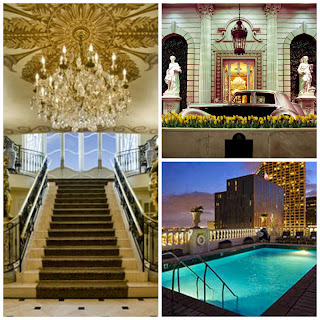 The hotel we stayed at was called Le Pavillion and it was gorgeous! The service there was so wonderful and we were treated like queens (and who doesn't love that, am I right?)! When we first pulled up, someone came right away to take our bags and valet park our car, which was so super cool. Then we waltzed into the beautiful lobby to check in (super cute room key)! After changing and unpacking, we walked about two blocks down to Magazine Street and stopped in to eat at The Ruby Slipper cafe. The whole atmosphere of the place was super cool and very New Orleans. There we had brunch which included French bread French toast, ham, bacon, and eggs. I had coke to drink...you'll soon learn I'm an absolute addict. Next we hopped down Magazine and shopped a bit before running back to the hotel, hiding from the rain while watching Disney movies in our robes, and getting ready for dinner. We popped into a cab around 7 and headed into the heart of the French Quarter to find dinner, where we ended up eating at Muriel's. Dinner was a bit pricey at $35 a person but it really was a wonderful experience. We felt so very grown up and sophisticated! For an appetizer I had seafood gumbo Sorry for the looks of it to all you non-southerners, it tastes better than it looks, I promise. For my main course I had the double cut pork chop, duck confit (switched with greens because I hate veggies, yuck! ), and pecan glazed sweet potatoes, which were heavenly. Last but not least, I had pain perdu bread pudding with candied pecans and rum sauce. Omgosh, the picture is missing a bite because it looked so great I forgot to take a picture before I dived in. Also, one of my friends got the flourless chocolate cake which I would also highly recommend. It's a mix between cheesecake and mousse and 100% delicious. The next morning, after some playing around in the Quarter, we made our way into a brewery on Decateur and I had the kid's meal fried shrimp with fries (I was still quite full from the meal the night before, and again, I'm so picky). Overall the entire weekend was a blast, I was treated like a queen, bought some wonderful clothes I'm now obsessed with, and got to spend time in one of my favorite cities! Hope you enjoyed reading about my Nola adventure! Its a beautiful and nice place for celebrating partie with light, swimming pool and delicious food. Thanks so much for sharing. Getting Organized...and staying that way!